Millions of plains bison used to roam at will on the Prairies, but they were brought to near extinction in the late 1800s. 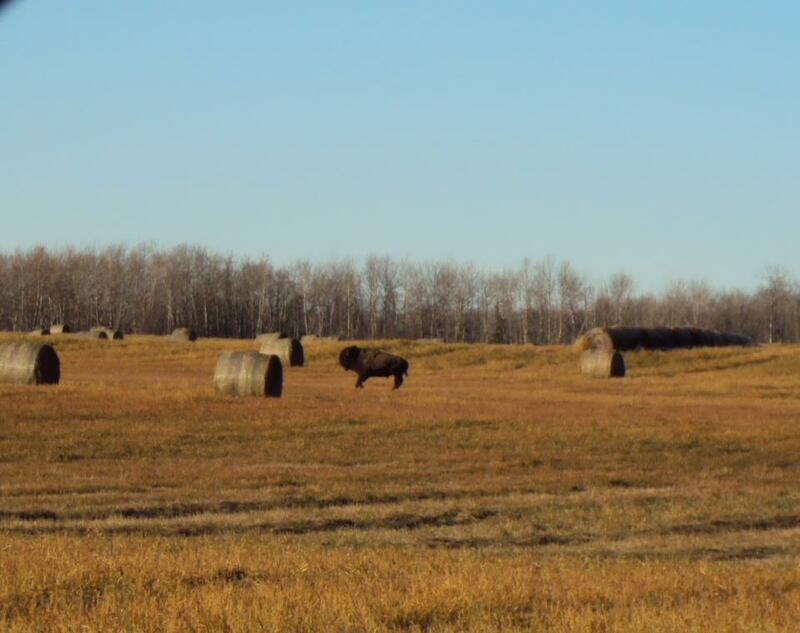 The Canadian government purchased one of the last remaining herds, and some of the animals founded the herd at Elk Island National Park, Alberta. 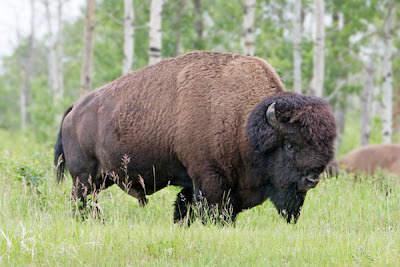 In 1969, 50 plains bison from Elk Island were released north of Prince Albert National Park. 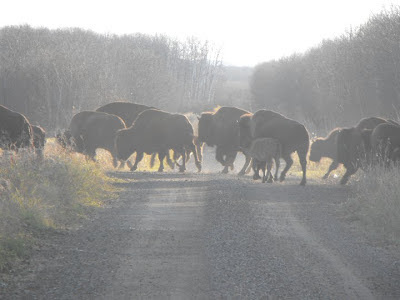 They moved southwards and, while most were relocated, some remained within the Park becoming the only free-ranging herd within the historic plains bison territory. By 2008, there were 400 animals (the herd is currently half that size), and they began to move out of the park and onto the neighbouring farm land causing damage to fences and crops. A group of representative landowners sat down with Parks Canada and Ministry of Environment representatives to develop a strategy so that bison and local residents could co-exist. 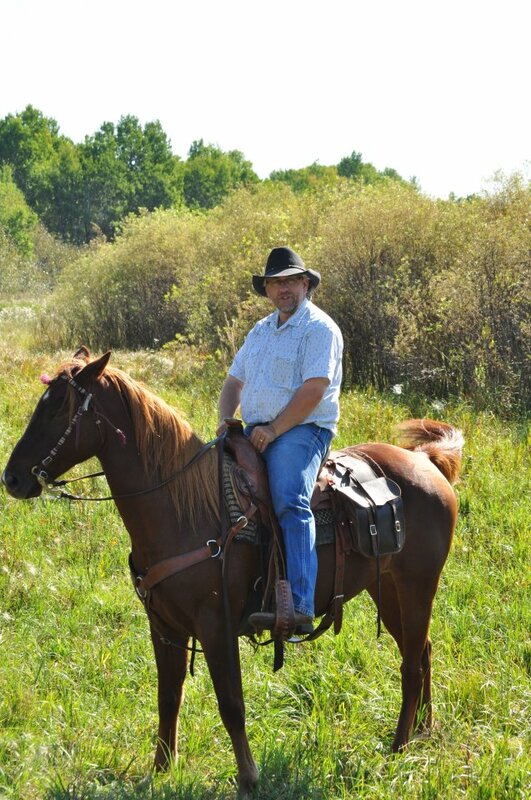 The Stewards work with the local landowners to address problems. The bison move out of the park from mid-August to mid-October, creating extra work for the farmers and ranchers who have to stop what they are doing to mend fences. The Stewards hope to establish a Fence Team. A phone call or text message from the landowner, and the fence would be fixed. The Nature Conservancy of Canada has been of assistance by purchasing parcels of land and creating easements so that the animals can move more freely. From a high point of 400 animals, the herd has dropped to 200, and the Stewards are concerned about maintaining a large enough herd to protect its genetic diversity. Diseases, such as anthrax, tuberculosis and brucellosis, can be a significant problem. The bison aren’t handled, so they can’t be vaccinated. Instead, the Stewards work with ranchers to vaccinate the cattle and to maintain a really high level of cattle health so that they don’t spread disease. When there was an anthrax breakout, the Stewards disposed of all the carcasses that they could find, both burning and burying them. Local landowners are actively discouraged from owning sheep as sheep carry a disease that’s fatal to bison. The Stewards also try to ensure that no domestic bison are loose in order to protect the wild herd from genetic contamination. The local First Nations harvest bison annually, often for their Elders. Unfortunately, they are under the impression that there are 400-500 animals, but this isn’t the case. The Stewards are talking to individual hunters and are setting up meetings with the band councils in order to provide them with accurate information. “We want to give the First Nations the correct information,” Vaadeland explains. “Once they know how few bison remain, they quit hunting.” The Stewards are also talking to landowners as First Nations aren’t allowed to hunt without permission. Vaadeland is sharing his knowledge as a Farm Stewardship Advisor with the Provincial Council of Agriculture Development. The provincial government provides funding to individual farmers and groups wanting to establish beneficial land management practices (establishing buffer zones to protect stream banks, improved water management systems, etc.). Vaadeland encourages farmers to set up a group plan. He finds a few local champions, shows them what they can do, and helps them with the paper work. The plan can be tailored to meet local needs and a local person is hired to operate the group. In addition, the knowledge remains permanently in the community leading to long-term change. “The Plains Bison Stewardship program has transformed the community of Big River,” Vaadeland says. “It’s very subtle, but we’re more aware. It’s opened our minds to new ideas. In 2008, Gord Vaadeland attended the World Landscape Sustainability Forum, sponsored by the International Union for Conservation of Nature. “I met some coffee farmers from India. They resolved their problems with elephants in exactly the same way as we did with the bison. Their ways of getting organized and working together were almost exactly the same as ours,” Vaadeland says. The Sturgeon River Plains Bison Stewards realized that their model could be applied internationally. With the support of the Prince Albert Model Forest, Gord Vaadeland is working with reindeer herders in Sweden and ranchers in Chile. In Sweden, the Sami reindeer herders have found their traditional migratory routes blocked by new development and are having to transport their reindeer by truck between their summer and winter locations. “It would be great if we could give the Sami a voice in the development process as more stakeholders move into the area,” Vaadeland says. Parks Canada hopes to introduce plains bison into Banff National Park. Unlike Saskatchewan, Parks Canada doesn’t always have good relationships with the neighbouring landowners in Alberta. Gord Vaadeland is working with Parks Canada and the local ranchers and farmers to establish a board of directors and agreements with the Park and other parties based on the Sturgeon River Plains Bison Stewardship model. “It’s starting out as a knock off of our plan, but it will develop unique aspects to fits is circumstances,” Vaadeland says.